Tonight’s episode is at once a perfect distillation of Sam’s mother Phil—vivacious, mercurial, but capable of immense vulnerability—and a departure from that lovable yet impossible character. Like its namesake, “Phil” is alternately full of gaiety and despair, of optimism and resignation. 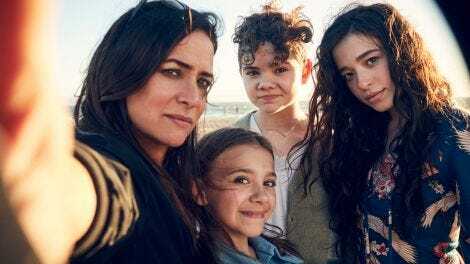 Pamela Adlon’s direction captures those quicksilver shifts, taking us from Los Angeles in the daytime to motels after dark; from sterile hospital rooms to cozy family dinners; from Mr. Might Be Right to Mr. Never Even Got A Name. The signs of Phil’s decline have been there since season one, though early on, the “looking after Mom” scenes were merely interruptions or just more stuff for Sam to deal with. She’s a part of the unofficial sandwich generation—adults who have children young enough to still live at home, but who are already looking after aging parents. Sam, it has been amply demonstrated, is caught between her obligations to her mother and her responsibilities to her children (not to mention her own career and desires). The season one episode, “Scary Fun,” alluded to her bind. “No offense, but you’re kind of mean to Gram,” a young Duke tells Sam. “Oh, you’re going to be mean to me, too. Your sisters already are. I need you to be mean to me when I’m old so I don’t feel so bad about how mean I am to your grandmother.” And she’s so used to the pressure that, even as she continues to crumble under it*, she would be thrown off balance if it were relieved. See “Rising,” where the promise of relaxation was much more appealing than the real thing, or “Sick,” where she experienced almost a physical rejection of a desirable and suitable partner. Phil is one of the yokes around Sam’s neck. A poised and prim yoke (and sorta racist), a hilarious and even occasionally affectionate albatross—but a burden all the same. This isn’t all that Phil is, of course; she’s also witty (and vicious), charming (and self-centered), and close to her granddaughters (though she seems to have traumatized Duke at some point). But, as Tressa notes in the quote above, there’s nothing either of them can do to lighten the load at this point. It’s no longer a simple matter of setting boundaries, though we do get a flashback to Sam demanding some. It becomes as clear to Sam and Phil as the viewer that something needs to change. And they both consider desperate measures, though Phil is the only one to act on them. Better Things takes its standard, warts-and-all approach (including levity) to these fraught matters, and turns up the best episode of season two so far. Where midseason installments often get stuck with burner plots, “Phil” is a culmination of the four episodes that preceded it. Hints about Phil “not being herself” have been strewn across the season, which has zeroed in on (one of) the central theme of growing older, which is not just moving middle age to old age. Even when we’re at our most perfectly apple-cheeked, we’re still getting older. For a while, that means getting stronger, smarter, etc. But then there’s a plateau, followed by a decline (for most of us anyway). This isn’t always a pitiable process, and I’m certainly not knocking seniors. My dad is one, and I saw a bunch of them running last weekend’s marathon (whereas I am only commenting on it from this safe distance). But for many of us, our bodies begin to give out, betray us. Phil once worried about losing her legs—her best feature—but now it looks like there’s a lot more at stake. Though it’s not exactly the same, we’ve seen Max struggle with getting older, too—although, when you’re under 21, it’s just called “growing up.” Sam gently chided her in “Robin,” telling her she needed to move forward, not back, but Max, who felt she moved too fast in her relationship with Arturo, remains uncertain. Her daughter might not appreciate it, but Sam urging her to get a license, to figure out that next step, is solid parenting. Once more, Sam is in the middle. She’s no longer in her youth, but she’s still far from her twilight years, which leaves her to look after the young and old. Again, it’s what she knows and what she knows she can do, so she just keeps doing it; as she tells her brother Marion (Kevin Pollak), “I’m just gonna do it until I can’t. Or she can’t.” And as determined as Sam sounds, and as much as she loves her mother, she is bound to complain about the responsibility again at some point. She’ll never shirk or nail it, but she will keep at it. Which is presumably why, after introducing having what appears to be a successful meetup between Robin and her kids, she goes right back to her ex (Mather Zickel), her hookup hookup. Maybe she’s worried about letting Robin down, after being reminded of his own single parent status. Maybe she fears disappointing her kids, who seem to have taken to him. Or maybe she’s recalling Phil’s description of her emotional balance—“one out, one in”—and is making some desperate bargain with the universe to keep her mom in her life. Whatever her motivation, Sam falling into old habits is a bit disappointing. Not because she’s bound to mess things up with Robin; we still don’t know how suitable a partner he is. But she obviously wasn’t getting what she wanted from her ex, who isn’t given a name on IMDb or Wikipedia. 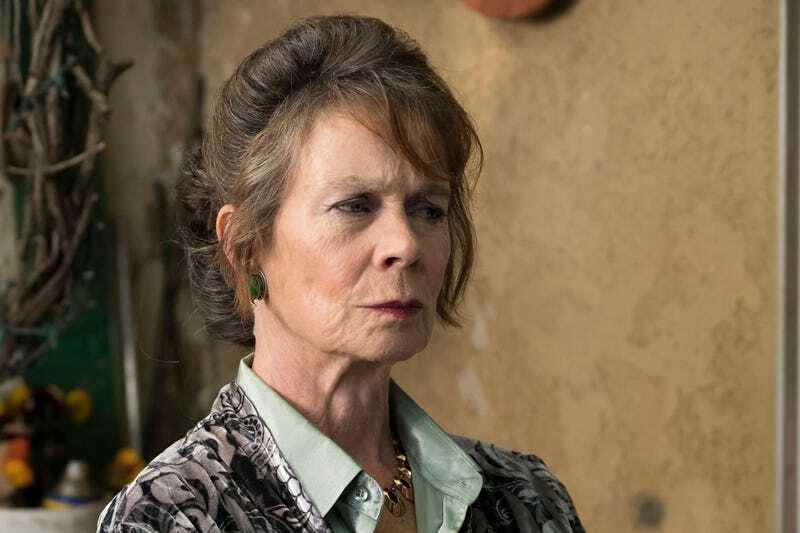 But this is, after all, a Phil episode, so let’s talk about what her future may hold, what drove her to desperation, and how pitch-perfect Celia Imrie is this episode. The opening scene saw her rendering harsher criticism than usual; you can read it in the faces of her otherwise rapt audience. It’s just the first indication of many this episode that something is off. Her attempts to refinance the house could go either way, but the lack of impulse control she has when she sees the jewelry in the ancient Egypt exhibit, and her own admission that she’s never stolen anything, suggest something else is at play here. That she decides to hurt herself rather than figure out what she can do after losing a volunteer gig speaks to her internal distress. Credit must be given to Imrie, who offsets the viciousness of her rant early on with her chipper elocution before adamantly telling her friends about all the love and pride she has for Sam. Her posture as she walks around the parking lot, trying to find her car, goes from upright and confident to increasingly stooped and worried. And her clear-eyed gaze when she opens up to Sam at the end makes her uncertain future all the more heartbreaking. But for all of the changes, dismaying and otherwise, that occur, “Phil” ultimately just reestablishes Sam and Phil’s dynamic, with Sam vowing to keep looking after her mother until she just can’t anymore, and Phil accepting that care. It’s one of the rare occurrences of Better Things standing still. Rebecca Metz was absolutely wonderful this episode—she managed to be both matter of fact and empathetic about ailing parents. And the story she told—about looking after a father who shunned her because who else was going to do it?—was heartbreaking and all too familiar for many. I have rewatched this episode more than any other, in part because I had a chat with Celia Imrie about filial attachment and her friendship with Pamela Adlon. But “Phil” also perfectly captures so much of what makes Better Things great. *: I’ll admit that I did a sloppy job pasting my review from Pages to Kinja, and I ended up losing a sentence in the 7th graf. I do not believe that any of this is easy for Sam, nor is she even handling it all that well. But it’s a familiar grind, and is “doable” in the same way that a haphazardly constructed Jenga tower looks stable to players until it comes tumbling down. I am going to edit the previous review.